Huawei has already confirmed that it will be unveiling the P10 on February 26, however, it looks like the company will also unveil a smartwatch as press renders of the Watch 2 have surfaced online. These renders were leaked by none other than Evan Blass and they not only show off the sporty look of the Huawei Watch 2, but, also show the Watch 2 in three different colors – Black, Orange and Speckled Gray. The Watch 2 is expected to run Android Wear 2.0 and also boast cellular functionalities. 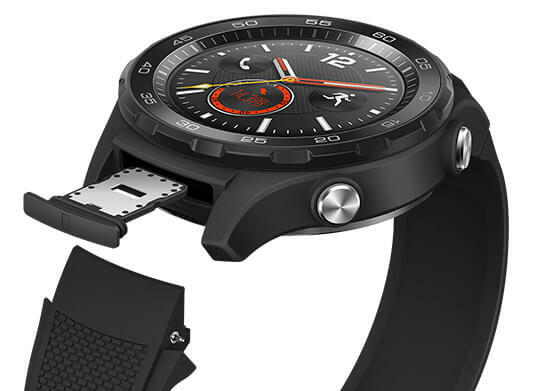 One of the leaked renders also shows where the Nano SIM card will be inserted from on the Watch 2. The smartwatch has two physical buttons and also seems to have Heart Rate Monitor along with rubber straps. The Watch 2 should also come with dust and water-resistance making it suitable for wearing during workouts and other forms of exercises. As of now, there’s not much information available regarding the Huawei Watch 2, however, we will know more about this smartwatch on February 26 when Huawei is expected to unveil it along with the P10 and P10 Plus smartphones.